Make sure that SQL Server is running an listening via TCP/IP. There are multiple ways of running SQL Server (Shared Memory, Named Pipes, TCP/IP, VIA), and it is essential that you have TCP/IP ENABLED.Â I don’t know if it comes by default with TCP / IP disabled, but it was on mine so this will kill you before you start if you dont have this sorted out. Make sure that TCP / IP is enabled.Â You might have to restart SQL Server from the Services Panel in Windows Control Panel. Make sure that you have Windows Firewall allowing port 1433 (default sql server port) or whatever you have it set to. Here is the dooosey.Â If you have a Cisco VPN client installed on this machine, there comes with it a Firewall, that will kill all port traffic.Â This runs even when the VPN client is not currently connected.Â To disable this, bring up the VPN client connection window.Â A System tray icon will pop up for Cisco VPN, there is an option for “Stateful Firewall, (Always On)”Â make sure this is UNCHECKED. Ok, before we can upgrade to FreeTDS and compile it with connections to SQL Server we need to download the FreeTDS library. This will install FreeTDS to you /usr/local directory.Â It is important to put it in this location, cause of the following next steps. Ok now, lets upgrade to 5.2.6 PHP. Grab the source code from PHP.net. Ok now here is the fun fun fun. FreeTDS decided in release 0.82 to change the way that it installs its compiled libs.Â PHP (as of 5.2.6) has not release an official update to this problem.Â FreeTDS.org/news.html has recommended adding dummy files to allow the PHP extensions (mssql, pdo_dblib) to compile correctly.Â This soution is not really solving the problem, so I looked to the PHP developers to see if there is a better solution. Low and behold, there was! These two sites discuss the problem in depth.Â The great news, they provided a Patch to solve the problem! Copy the patch file to your php src directory (/usr/local/src/php-5.2.6). You are off to the races!!! I plan to use both, but Symfony will allow me to read the schema directly from the SQL Server, and build out ORM objects based on their schema!!! P.S. Dont forget to restart Apache!!! PHP lives in memory based on the last apache restart, so you wont see changes reflected until you force restart apache. Font looks Arabic in Apple Mail or Safari? Hey these guys found out why having certain installed fonts can screw up your fonts. More of Rufus in the pool…. If you spend as much time on your computer as I do, you start to take concern for its well being. Most of the time this involves doing regular backups (Not the best at that), running software updates to protect your sweet lappy, and just being generally careful around your expensive equipment. Last night, for a brief moment in time I thought, “hey my lappy is running kind of slow, maybe it needs a pick me up, the kind of pick me up that only a Kayak’s Skim Latte can provide !!!”. It was then that the entire contents of this latte was spillled through the rear heat exhaust openings of my 17″ powerbook, you know cause that looked like what might have been a human mouth. Quickly, expletives were shouted, at my realization that I had not helped my sweet lappy, but rather wounded it deeply, as my speakers crackled, and desktop froze to a grinding halt. I thought to myself, “Quick turn it on its side to allow coffee to drain out ! !” What foolishness we do when our young ones are threatened. So next step, I dash out of the coffee shop holding laptop flat so as to halt the spread of the evil beverage throughout the chassis. 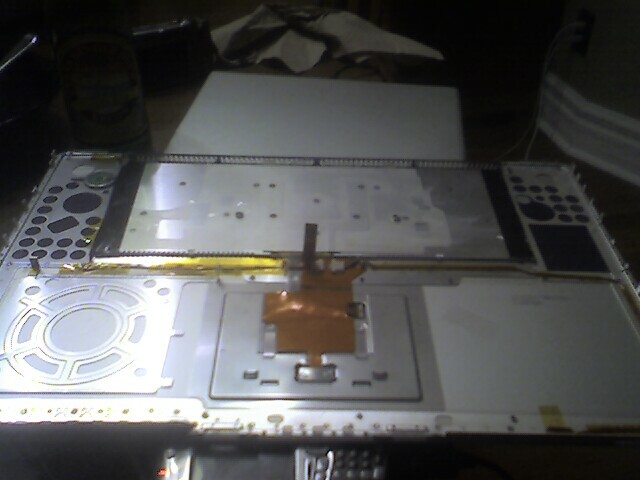 I get home, tear around the house looking for the correct screwdriver to undo the chassis to get a look at the damage. I got open a few, but then was thwarted because of not having a small enough screwdriver to open up the case. I then thought to myself, who could I call to help with through this difficult time? Who could empathize with my situation, as well as help me out of the mess I was in. I think it is important to note at this point, that I am a web developer, and spend nearly 70 percent of my life on this laptop. I had work for a client that had parts that had not been checked into the subversion repository at work, and would be lost if I could not get the system back up and running. Gabriel Serafini to the rescue! 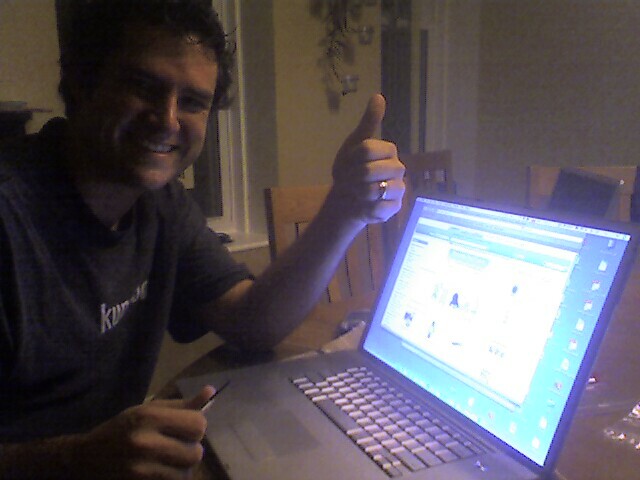 He had the tools, the empathy, and the know-how to get my sweet lappy back into good health. 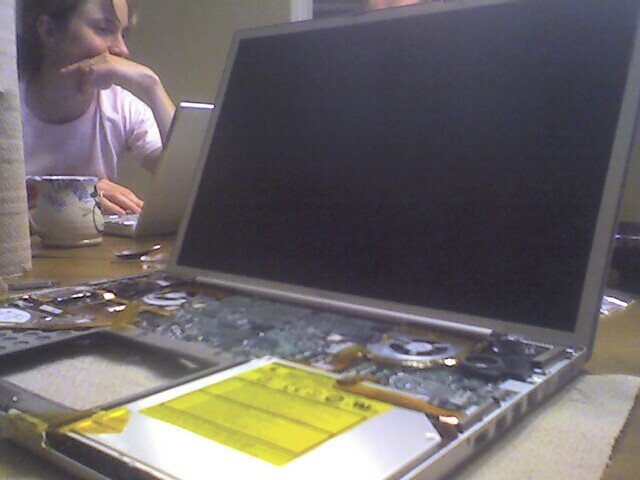 Lappy with Case Opened Up. 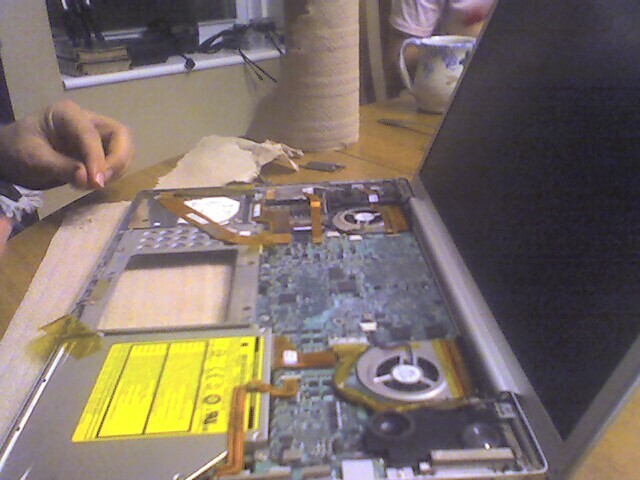 More Lappy with Case Opened Up. Now my sweet lappy is running great, the speakers no longer crackle, and I was able to get a lot of the little orange balls in my laptop case cleaned out. Anyone else found little orange balls that look like Fish Rouge (found often on sushi) in their laptop case? The most current theory is that this is actually adhesive that has formed into pellets from the hear emitted from my laptop. I am very grateful for this bit of sleuthing that went on at the AI3 blog. 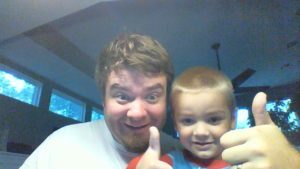 I am using this nice little hack, and will certainly use it on my all other blogs. I love Robert Cringely’s pulpit column at PBS.org. He always has a depth to his analysis that I appreciate. Last week, he talked about YouTube because c’mon, WHO HASN’T! For crying out loud, my grandmother asked me about it. If there is anyone out there who says that YouTube isn’t a common household word, I challenge you!!! My grandmother knows about YouTube. I cant get over it. He says this because he feels like the big media conglomerates are going to be dumping old television pilots and series that never made primetime, have already been paid for, yet give their network visibility. Is YouTube the next evolution of TV? Robert seems to think that it is up to us! That is because it is a social network. It ceases to be used when people dont use it. Thanks Robert for your column! Here is an awesome article on how to convert that old x86 server into a sweet Internet Appliance Server.